Kacie Komoto tees off. The senior and the Wildcats lost in the National Championship final Wednesday, but still secured the best finish in program history. A late slide at the Big Ten Championships. An up-and-down regional. A national ranking outside the top 10. The numbers and results didn’t seem great for Northwestern entering the NCAA Championships. But something happened this week at Rich Harvest Farms Golf Club as everything coalesced for the Wildcats en route to a runner-up finish. NU didn’t win the title, but it was nonetheless a remarkable performance against the top teams in the country. The Cats did their work in particularly impressive fashion. 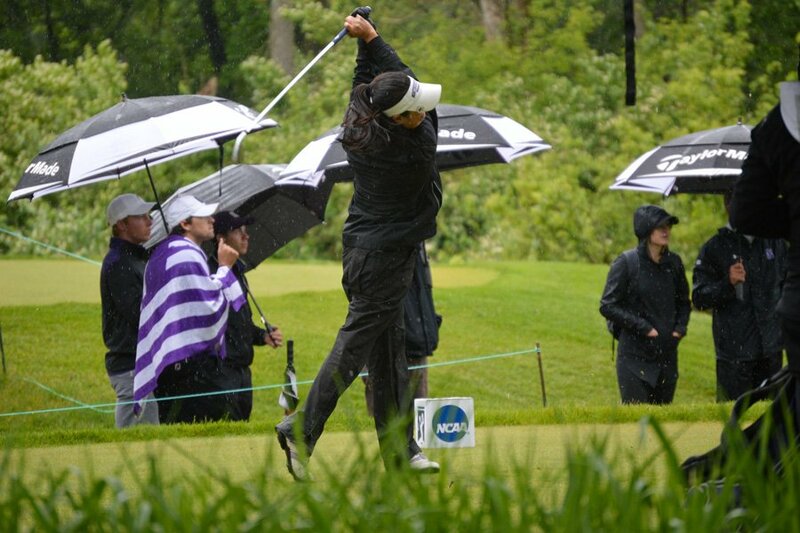 As team after team put up stunningly high scores in challenging weather conditions, NU went about its business coolly, leaping to a first-day lead and never relinquishing it. Against a field of higher-regarded teams from the Southeast and West Coast, it was the Cats who were most unfazed. The numbers themselves were not necessarily impressive — no team round better than 10-over-par — but featured an impressive display of consistency that made NU look like a team of well-prepared, experienced veterans. That, certainly, was true. The Cats returned their entire lineup that finished one stroke short of the match play last year and reset the program best finish in both 2015 and 2016. But NU didn’t just bump up its program best; it completely obliterated it. That’s a testament to coach Emily Fletcher, who scheduled a rigorous slate of match play competition all season to prepare her team for occasions like this week. That was particularly evident Wednesday morning, when the Cats’ semifinal match against USC resumed. Trailing nearly across the board against a higher-ranked team, NU managed a stunning comeback. Senior Kacie Komoto shook off a three-hole, three-to-play deficit to push her match to extra holes. Junior Hannah Kim took both 16 and 17 to win hers. Then, sophomore Janet Mao won both the 18th and the first extra hole to send the Cats to the final. The Cinderella run, of course, ended there. NU had no more fairytale comeback, no massive last-ditch effort to bring a trophy to Evanston. And that’s disappointing. On the cusp of a national title, the Cats struggled badly in the short game as Arizona State excelled. In short, it wasn’t NU’s best performance of the week. But the overall performance was the Cats’ best ever, and that should be the big takeaway. The regular season results weren’t outstanding, and Kim, NU’s undisputed best player, didn’t capture Big Ten Player of the Year honors like she did each of the two previous seasons. Still, through mental toughness, thorough preparation and clutch play, the Cats set a new, lofty standard.